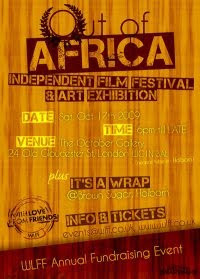 WLFF is holding ‘Out of Africa – Independent Film Festival & Art Exhibition’ on the 17th of October 2009. The event has been organised solely to raise funds for a poor school in the Bariga area of Lagos, Nigeria as part of a project we call the ‘Mobile School Initiative 2009’. With Love From Friends (WLFF), is a UK based non-profit organization which impacts positive change in Africa, through education. In 2008 we raised £6,000 for the Iwaya book fund project and detailed the implementation experience on our website at http://www.wlff.co.uk/node/44. This year, WLFF will be working with a Charity in Nigeria - Bethesda Child Support Agency (BCSA), as part of efforts to provide quality education to a community in urgent need in Bariga. WLFF will equip two free mobile schools with key learning tools including books, white boards & other educational material. Once the school’s permanent building (currently in construction) is complete, the mobile school will be used as an arts and crafts center or in aid of another community. • A selection of African short films • Awe inspiring African themed Art on display • African themed Canapés • Drinks Reception • Delightful African music by greats including Fela, Youssour N’dour • Exciting Raffle prizes • A variety of other African themed offerings • At the exclusive October Gallery, Holborn, London • Free entry to Wrap party at nearby Brown Sugar Bar, featuring - chart topping tracks spun by our DJ & other exciting WLFF treats. Good luck to WLLF, great initiative. Hi! Just a quick word to say tickets to the event are now available till the 16th of October. Please see our website for further details. Attended the event and it was great bar a technical hitch. A crowd of up to 200!! And also met the wonderful Winnie who you definitely need to get interviewed on Next. Great spirit.